A soft, fresh, mild tasting cheese, slightly lemony and acidic. Refreshing 'as is' or as an ingredient. While the taste is totally unique, its other special attribute is texture. 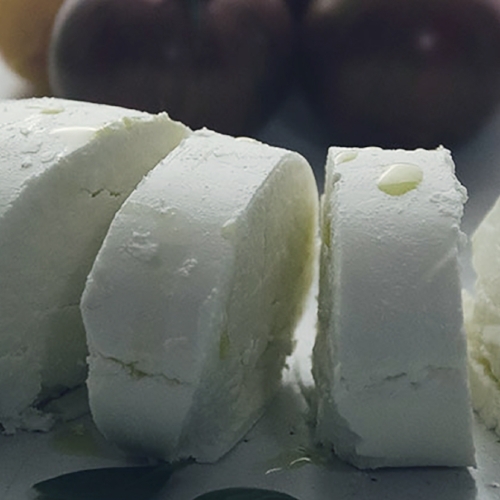 Nothing else can deliver the impression of richness without the fat and calories, and it's this that distinguishes a goat milk fromage blanc from cow milk versions. Only goat milk produces a cheese that's light as a cloud and silken on the tongue. 2003 American Cheese Society award winner. Fresh Goat wrapped in chestnut leaves. Traditionally, the chestnut leaves used to wrap the cheese were soaked in eau de vie. We use Woodford Reserve Bourbon. The tannins in the leaves and the bourbon combine to give this creamy, dense cheese just a nuance of a kick! At 2 months old it's better than at 2 weeks. The O'Banon is vacuum packaged when the leaves are slightly wet. It can be removed from it's packaging and allowed to ripen under the leaves. 2001, 2004, 2007, 2008, and 2014 American Cheese Society Award Winner. This little cheese is buttery and smooth like an Old Kentucky, but nuttier and firmer like aTomme du Savoie, and, with a mushroomy natural rind of herbes like a Brindamore or Fleur du Maquis--ie. it's own thing! Intense, beefy, earthy--all describe this 1+ lb. aged wheel with a reddish, washed rind and the typical pungent odor to match. Mont St. Francis is a hearty, stinky, cheese, semi-hard and rich. Pairings: Because it is extreme, it pairs well with bourbon or fruity, fortified wines and sweet condiments. Also excellent with bitter beers. Trying to think of something that this doesn't go with--from pickles and ESB beers to shaving it on peaches burned off with bourbon and brown sugar. Chocolate also works, but our favorite condiment is a pear or pumpkin mostarda. A spicy Pinot Noir; a fruity, late harvest Zin; and the sweet vanilla and caramel edges of a smooth bourbon. Buttery and rich, with mild “cellar” and mushroom overtones, this aged cheese falls somewhere between an American Jack and a Tomme du Savoie. When young it has a smooth pate, and a white to grey/tan rind. 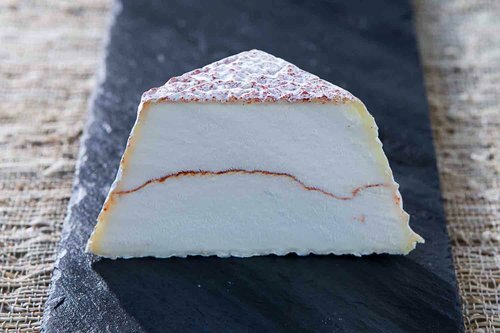 The rind becomes crusty and darker with age and the flavor develops a slight lipase "kick" at the finish, while the texture becomes more translucent and brie-like. Old Kentucky is sumptuous, but not cloying, and is better by compliment rather than contrast. Pairings:This is a wonderful melting cheese and in combination with savory elements or gratinees, tapenades, and especially grilled apples and onions. At its ripest its meant for the cheese tray, and our favorite condiment is yellow tomato and ginger preserves. It pairs well when young with soft red wines and when older ,with chardononay or sauternes. Hand-ladled into 1lb. 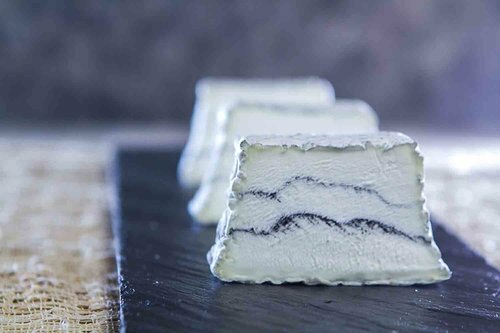 barquette molds and marbled with ash, it's texture is fine and silky in the mouth, becoming denser and more velvety with age. It ripens under a light, wrinkly geotrichum rind, delicate and slightly sweet. Pairings: honeyed berries, slightly acidic preserves, or a drop or two of really old balsalmico. When young, with crisp, light wines and sparkling wines or rose. When older, riper, denser, with sweet whites like sauternes or moscatos. Dusted with ash this little chevre is thin skinned, white, and slightly wrinkled when new. At 3 weeks the geotrichum rind becomes more deeply wrinkled and the ash begins to appear through the rind. The pate becomes denser, and eventually, at 3-5 weeks, is drier and more crumbly. Great in all its stages, this is perennially a favorite. 1995 Best-of-Show, American Cheese Society. Pairings: Cannonballs are best on a cheeseboard, served with a chilled Sauterne or sweet Moscato as, or before, dessert. Wonderful with figs--a variation is to place a ¼ wedge in a fig. Drizzle with a light simple syrup infused with vanilla bean & lavender, rosemary, or lemon verbena. Creamy and dense with a dusting of paprika under its wrinkled, white rind (with occasional spots of blue), this lactic curd chevre is hand-ladled and has the same velvety texture as Sofia. Its flavor is refreshing and lactic, slightly sweet and buttery, with a musty edge. Pairings: Love it's creamy texture and piquant edge with sweet/tart fruits and strawberry, balsalmic compote. When young, with crisp, light wines and sparkling wines or rose. When older, riper, denser, try it with sweet whites like sauternes or moscatos. Pair a young to medium ripe Flora with: Albariño, Pouilly Fuisse, Vouvray, Rosé, Sancerre, Prosecco, light gin cocktails, Virtue Cider Lapinette, floral Saisons, and Wheat Ales. Plum and berry jams. Pair an older, very ripe Flora with: Extremes on the savory or sweet ends of the spectrum. Olives, charcuterie or sweet fruits and compotes, chocolate, honeycomb and Sauternes and moscato. Pouilly Fuisse, Sancerre, Rosé, Albariño, Goose Island Matilda, Virtue Cider Michigan Brut, gin and tonic.